Aliquoting Pipet Controller for repeat pipetting like never before! Repeat pipetting with your serological pipets! PLUS repeat pipetting like never before! No special costly tips necessary! One-touch repeat pipetting for better accuracy and repeatability. No need to watch the lines on the pipet for multidispensing. Now also available in Low aliquoting Speed (LS) version, ~50% lower force, suitable for working with more sensitive cell lines. Select ali-Q LS when you need gentler multidispensing. A time saver and easy to use. Increase your productivity! For all those tubes you have to do, just pick up an ali-Q! Intelligent measuring system = real-time corrections for varying environmental conditions- No adjustment necessary! Self-standing, like all Ovation pipettes! How is ali-Q different than any other pipet controller? What sets ali-Q apart from every other standard pipet controller is its revolutionary aliquoting technology. Simply turn the aliquot volume set dial to the volume you wish to repetitively dispense. Finally, press and hold the purple aliquot button to dispense each aliquot. Eliminate time-consuming and inconsistent meniscus eyeballing! Let the ali-Q‘s state of the art intelligent measuring system do all the work for you! NOTE: ali-Q can also be used the same way as any other standard pipet controller! What volumes can I aliquot? 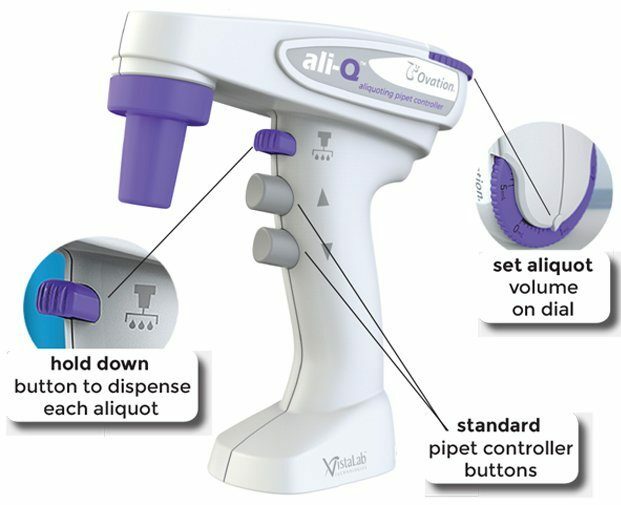 The ali-Q “Original” can be set to accurately dispense aliquots up to 5 mL using the aliquot volume set dial. The ali-Q “LS” lower-speed model can be set to accurately multidispense up to 3 mL using the aliquot volume set dial. 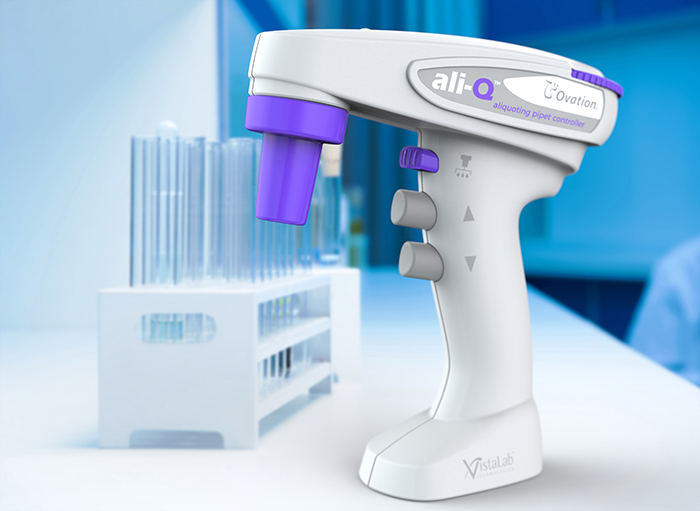 The number of aliquots that can be dispensed is only limited by the size of the serological pipet used with ali-Q. How many aliquots can I dispense? The number of aliquots that ali-Q can dispense in one cycle is only limited by the volume capacity of the serological pipet used! What are the accuracy and precision performance specs? When using ali-Q as a standard pipet controller, the accuracy and precision (CV%) is determined by the graduations on the serological pipet used, which are typically 1-2%, as well as the user’s ability to consistently eyeball the meniscus and control the liquid dispense. NOTE: ali-Q is factory calibrated with Wobble-not serological pipets for optimal accuracy and precision. What effect does varying temperature, humidity and pressure have on the performance? Whether you are on a mountain top, desert plains or a tropical island, the ali-Q‘s state of the art smart measuring technology will compensate and correct for extreme environmental conditions! Thanks to the numerous high resolution sensors, gauges and valves in ali-Q‘s intelligent measuring system, ali-Q can automatically make adjustments to dispensed aliquot volumes in real-time to compensate for varying environmental conditions! No need for in- lab calibration adjustments or correction factors! What effect does varying dispense angles have on the performance? Whether you’re working in a hood, or on an open bench top, you can be confident in the accuracy and precision performance. The ali-Q has an internal accelerometer that makes automatic real-time adjustments to aliquot dispensing at varying angles. No need for awkward and uncomfortable body positioning and contortion to maintain a 90 degree dispense angle! Why does my ali-Q randomly make noises when I'm not using it? You may have noticed your ali-Q is very sensitive to movement and vibrations. Even the slightest action can cause it to ‘wake-up’ from sleep mode. The ali-Q will automatically put itself into sleep mode after being motionless and unused for 30 seconds. The internal sensors in the ali-Q will automatically wake it from sleep mode when it is picked up or moved. These sensors are very sensitive to movement, so even vibration from dropping a book on the desk or somebody bumping into the desk can cause it to wake up. When it wakes up, you will hear the motor activate for 1-2 secs while ali-Q gathers information on its environment.